I read this article and thought it was brilliant, thought it might be something for you. The article is called How to manage your money when travelling in Latin America and is located at https://timeasatraveller.com/how-to-manage-your-money-when-travelling-in-latin-america/. "How could you be so complacent as to arrive with no money??? You've travelled the world... for years.... How could you possibly have let this happen???" That was all I could hear from the voice inside my head as I stood at the baggage carousel. You see, I was meant to meet my travel buddy on the connecting flight from Bogota, but he'd missed the flight (thanks to a mugging in Quito the night before). He'd been on the road for months so I just assumed he'd have cash, all I had on me were my cards... and the 2 ATM's outside were broken. I walked out of Santa Marta airport into the heat of north coast Colombia and into a taxi, deciding on the "ask for forgiveness instead of permission" rule. I handed over the name of the hostel I’d written on a scrap of paper, and off we went. Once we were on the road I fumbled out enough Spanish to convey my financial situation. He agreed to accept the 2000 Colombian pesos and $14 US dollars I happened to have in my money belt from previous trips… only if I threw in the fancy $20 Canadian dollar note he saw in my hand, “It's worth nothing here, but I like it”. So we settled on him over charging me in foreign currency with a smile… and me getting to my destination. 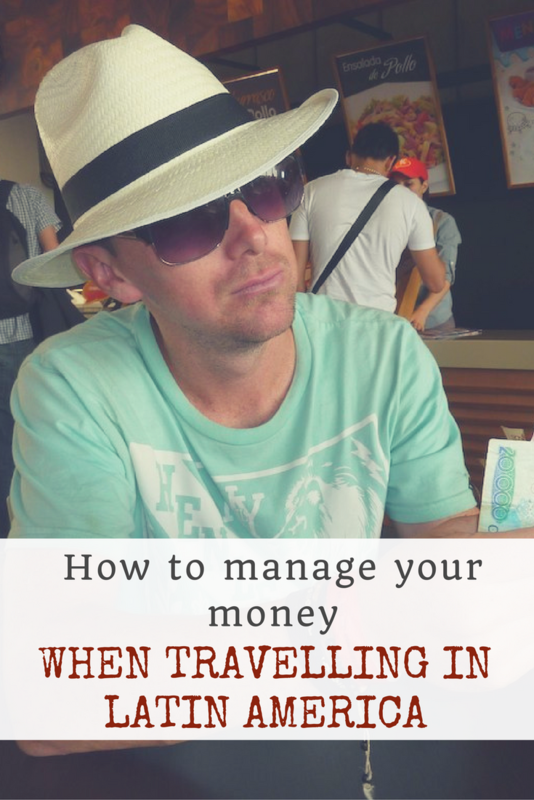 Even seasoned travellers screw up organising their travel funds. Money to travel. It's the most important thing to have organised, yet most of us are guilty of leaving it to the last minute. Here are our top tips for managing your money when travelling in Latin America. Depending on the country you're from, banks can charge exorbitant fees for using your card overseas. From my experience, Australian banks are some of the worst offenders and UK banks can be more reasonable, but do your research. You will be using atm's so find a card that's going to serve you. Ideally you want something that isn't going to charge you to withdraw money overseas and that's going to give a good exchange rate. Working back from this, alternatives are a card that gives a set low fee per transaction (not a percentage of what you withdraw) or monthly fee if you're travelling long term. For me, my UK bank debit card charged me £12 per month for unlimited international transactions and gave the proper exchange rate. This was brilliant for my year long backpacking trip around Latin America. Travel Cash Cards - If you're considering these, check if the currencies you need are supported by the card. For example, in Australia the Quantas Cash Card does not support any Latin American currencies, but the STA card can be used at any ATM where Visa is accepted, but both have a bunch of additional fees if you check the fine print. So be sure to do your research. Remember to tell your bank your travel dates, many a traveler has been caught out when their bank has cancelled their cards unexpectedly. If you're using a bank debit card (which is the most likely option), make sure it has the Maestro or Cirrus symbol on it. There are various other symbols for international use, but these are two that I know work in Latin America. These symbols pretty much mean that the card is a part of a network of banks that work together and allow you to access your account. Without this, you've no access to your funds. Cards and Cash. Always have multiple options. Cash: In Latin America, the $US is accepted widely, if not for purchases then it's easily exchangeable. And a cab driver will often accept these if you're stuck like in my situation, just be prepared to be charged whatever the driver wants to charge. So be sure to leave home with some $US on you in case of emergency, in small notes. Things like Australian dollars are nothing but pretty pieces of papery plastic. Cards: Always have more than one option, and keep them separate. I always carry a separate debit card for a different bank in a secret spot in my pack for just in case. Having an emergency credit card is a must, but be sure not to use it for general purchases as you'll stack up fees and charges and it'll likely end up stacked with fraudulent charges. Check your statement online regularly, just in case. And despite the nifty advertising, American Express is not widely accepted. Travellers Checks - "Sure we accept those" Said-no-one-ever (about as helpful as an American Express card). These were left far behind in the nineties, be sure to leave them there. We've all heard the stories of travellers getting kidnapped and taken to the ATM daily to withdraw the daily amount until the money is gone. It's rare but it has happened. Then there is the potential for fraud when using your card at an ATM. So if you're using a debit card, keep your money in a different account (for long term travellers, an online savings account with no card access is a good idea) and transfer accordingly to the account your card is attached to. I kept £500 in my travel debit card account at a time, and felt pretty safe with this. That way I didn't freak out each time I went to the ATM. There are local ATM's and international ATM's. These are different. A local ATM won't work and may eat your card, an international ATM will have a variety of symbols on it telling you which cards are accepted. Match the symbol on your card with the symbol on the ATM (Maestro or Cirrus for example). Simple, but often overlooked. Take general common sense precautions. Visit the ATM during the day in populated areas. Don't use a machine that looks shady. Separate your cash once you've taken it out. Be discrete. Etc etc. Always split it up, and try to keep it separate on your person. Never carry all your cards on you at once. Leave any cards / cash back at your accommodation locked up. A lot of travellers in Latin America keep a 'fake wallet' in their pocket with just some cash for the day, if you get mugged then you hand over this and you don't loose everything, or your cards. For overnight bus travel with all your belongings, again be sure to split up your financial resources. You can read our night bus survival guide here. Long term - 1 year backpacking as a solo traveller. HSBC debit card - this was my main account and cost me £12 per month for unlimited international transactions (this was back in 2010, so things have likely changed). I'd leave £500 in the account at a time and the rest of my travel funds for the year in a linked HSBC savings account that had no card access). Second debit card for emergencies - I had a basic debit account with a separate bank and kept a few hundred pounds in it for emergencies. I kept this card in the hidden pocket inside my main pack. It stayed there for most of my trip, and luckily I never needed it. Credit Card - I kept this wherever my passport was, again it was only for emergencies. I never used it for purchases, mainly only for online booking of flights etc. Cash - $100 US in small notes (nothing over a $20 note), also kept with my passport. If I was taking a night bus or had all my belongings on me at once, I'd put some of this in my sock, yes.... I really did this (buses get hijacked in South America). Cash - local currency. After taking cash from an ATM I'd split it up. Some in my pack, some on me. With all of these options I felt secure travelling alone long term and didn't freak out about my finances. Debit card, emergency credit card, about $US50 in small notes, small amount of local currency to get me from the airport to my accommodation / for the first day until I found an ATM. How did we go? Did we cover everything? Feel free to add any of your extra tips for managing your money when travelling in the comments section below! Great tips! People think just because traveling Latin America is cheap you can do whatever you want. Not so! You still have to budget! We spent a ton more money in Peru than we would have wanted otherwise! These are super helpful tips. I tend not to use debit cards when I travel anymore, but I do like the idea of having separate accounts and separate stashes as you go. Any way to limit those losses is key. I’ve been with someone who got robbed, and she lost everything (including her passport). Definitely not a good time. Tweeted! Thanks Patricia (and for sharing 🙂 ) Spliting up your researouces is definitely key, especially when you’re travelling alone and you’ve noone else to rely on! Very helpful tips for travelling in Latin America. Separating funds among wallets and keeping a bank account fairly tight is a good idea, should the worst happen. And yes to using a safe if there’s one in your hotel! Thanks Claudia, glad you found them helpful. Yep, if you’ve a safe in your hotel then fabulous, otherwise I lock up my backpack if in a hotel or most hostels wil have lockers. These are great tips, not just for Latin America, but for all over the world. Not leaving all of the money in your travel account is a big one. Also, because people could spend it all if they steal your card. Excellent advice! In this day and age it is so easy to assume that ATMs are readily available! I have used Canadian toonies and loonies to top-up taxi fares and tips at times – it is an attractive currency. Keeping your valuables in your sock is a good idea – I always carry a photo-copy of my passport separate from my passport and take a photo of it just in case. It is indeed an attractive currency 😉 A photocopy of your passport is a great tip also, I forgot to add that in! Take a photo of your ID page and send it to your email.